It might be tiny, but this little cottage is just loaded with charm! 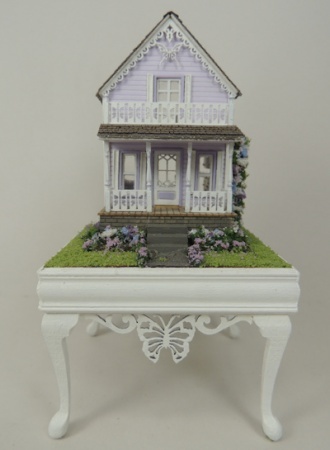 Inspired by a real cottage at Martha's Vineyard, this cottage features a darling butterfly motif, The exterior features porch railings with butterfly cutouts, and the gable trim features an elaborate butterfly too. 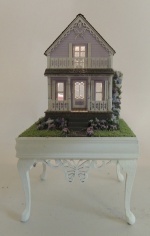 The lovely soft lavender color is so much fun to work with, as it continues thru beautifully to the landscaping. The cottage is two floors, a main living floor with small kitchenette, butterfly dining set and sofa. 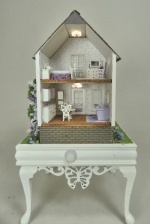 The upper floor has bed, dresser and rocker. All wallpapers rugs and fabrics have been designed to coordinate with the theme and color. 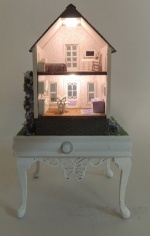 The cottage is lit and is powered from a coin cell battery which is hidden beneath the display table. A handy on/off switch extends out the back side of the table for easy access. 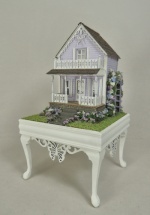 Entire piece (including table) measures 5 "h x 2 3/4"w x 2 3/4" d.
The table features delicate legs and gorgeous fretwork trim which again incorporates the butterfly theme. This is a highly detailed project. While it is not difficult to assemble, the pieces are very tiny and you will find you need a good set of tweezers and some fine paint brushes. All materials and supplies are included. Students will provide all paints, and glues, as well as general tools such as Xacto knife, tweezers, toothpicks, etc. Instructions will be provided in a comprehensive online tutorial which will include both photo and written instruction for each step of the project.